The only two of the great religious teachers who were successful during their own lifetimes were the Mohammed and Siddhatta Gotama, the Buddha. Both had long teaching careers and both lived to see their respective religions firmly established. Prof. Basham has written that Buddhism was a minor religion until its adoption and promotion by King Asoka. Basham bases his assumption on the fact that there is no archaeological evidence of Buddhism before Asoka’s time but this seems to me to be a rather weak argument. What physical evidence are wandering ascetics, which are what the Buddha’s disciples were, likely to leave? They established few permanent monasteries and those they did build were made of mud, bamboo and thatch. As for stupas, these did not become an important feature of Buddhist worship until about the 2nd century BCE. The Pali Tipitaka offers ample and convincing evidence that the Buddha was well known throughout wide tracts of northern India and that his Dhamma attracted large numbers of converts from all classes, especially the elite. The highly critical attitude of Jains and brahmins towards the new teaching as recorded in the Tipitaka suggests that they saw it as a real threat. 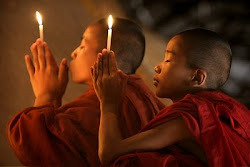 An important cause of the Buddha’s success was no doubt his extraordinary personality. Even despite the great distance in time between he and us, the heavy editing of the suttas and their rather stilted language, the Buddha’s warm and compassionate presence shines through on nearly every page. 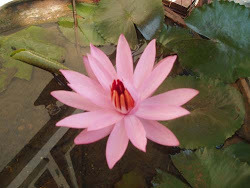 The logical consistency of his Dhamma must have been an important factor also. However, no matter how appealing a teacher or how common-sense a teaching it will not attract converts unless they can come into contact with it. 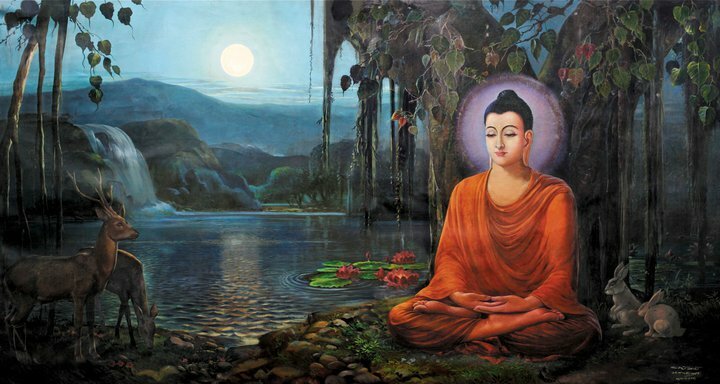 The Buddha was a missionary from the very beginning and this was, together with the two things mentioned above, the most important factor in the early succe ss of his teachings. He had a still heart but a very mobile body. According to the Tipitaka, almost the first thing the Buddha did after his enlightenment was to embark on a long journey in order to teach others what he had discovered. Equally significantly, his instructions to his first five disciples was that they should ‘wander forth’ to teach others what he had taught them. The area in which the Buddha wandered during his life corresponds roughly to the modern Indian states of Uttar Pradesh and Bihar. The furthermost east he went which can still be identified is Kajangla (now Kankjol, 18 k south of Rajmahal right on the Indo-Bangladesh border) and the furthermost west he is known to have gone is Mathura, some 180 kilometres south of Delhi. These two locations are nearly a thousand kilometers apart. The Buddha’s movements northwards were of course limited by the then impenetrable jungles of the Himalayan foothills and it is unlikely that he ever went further south than the southern edge of the Ganges watershed. Still, this would mean that his wanderings covered an area roughly equivalent to 200,000 square kilometers, a huge area by any standards. The evidence suggests that the Buddha only occasionally visited the outer edges of this region. For example, he only visited Mathura once and he probably visited Anga in the east (i.e. Campa, Bhaddiya and Kajangla corresponding to modern Bhagalpur District) only once also. Incidentally, I believe that Bhaddiya or Bhaddiyanagara as it is also sometimes called in the Tipitaka, can be safely identified with the village of Bhadariya some 12 kilometers south of Bhagalpur. However, most of the Buddha’s wanderings took place in the eastern part of this area, between the great cities of Savatthi, Rajagaha, Vesali and Kosambi. The Tipitaka mention carriageways in towns and paths, roads and highways through the countryside. However there is little doubt that these names referred to the frequency of traffic on these arteries, not to the quality of their paving or their width. All roads in ancient India were little more than dusty, rutted tracks in the summer and impassable rivers of mud in the rainy season. Banditry added to the risks of long distance travel. Travellers on the road between Savatthi and Sakheta were often robbed (Vin, IV: 87) and of course the fearsome Angulimala was a robber and murderer who operated in forested areas around Savatthi. Once the Buddha and an attendant were on tour of Kosala when they came to a fork in the road. The Buddha said they should take one fork while the attendant said they should take the other. This debate continued for some time until in a huff the attendant put the Buddha’s bowl down and walked off on the way he thought correct. He hadn’t gone far before he was attacked by bandits who ‘struck him with their fists and feet and tore his robe’ (Ud, 90). In the more remote districts travellers might have difficulty finding food, water and shelter. The Tipitaka mentions a traveller getting down on all fours to drink from a puddle in a cows footprint because no other water was available and of two parents lost in the wilderness who saved themselves from starvation by killing and eating their child. More normally though travel was just uncomfortable, tedious and undertaken only when necessary. And yet it seems that the Buddha spent most of his time on the road in order to reach as many people as possible. Such was his determination and compassion. We read of monks once crossing a river by holding on to the tails and backs of a herd of cattle that was swimming across the same river suggesting that when there was neither bridges, boats or rafts that the Buddha might have had to improvise as these monks did. There is no mention of the Buddha travelling by carriage or cart. 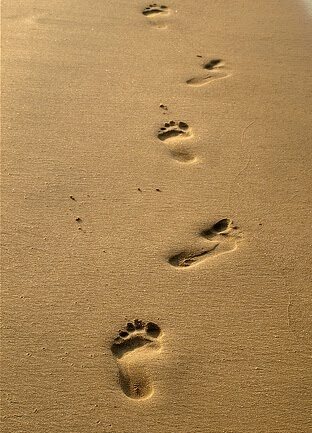 In only one place is he described as wearing sandals, so he probably went bare footed most of the time (Vin,IV:186). The Tipitaka mentions the itinerary of many of the Buddha’s journeys giving us an idea of the distances he sometimes travelled. For example, we know that within the first twelve months after his enlightenment he went from Uruvela to Isipatthana via Gaya and Benares, spent the three months of the rainy season there and then travelled to Rajagaha via Benares, Gaya, Uruvela and Lativanna. All these places can be identified with certainly and thus we can calculate that he must have walked at least 300 kilometers. In the longest single journey recorded in the Tipitaka, he went from Rajagaha: to Vesali to Savatthi and back to Rajagaha via Kitigiri and Avali, a round trip of at least 1600 kilometres (Vin,IV,189). It is likely that he would have started a trip like this at the end of the rains retreat and arrived back in time for the next retreat nine months later. Unfortunately, it is not possible to know how much time these or any of the other journeys might have taken. In the famous Mahaparinibbana Sutta we know that he went from Rajagaha to Kusinara via Nalanda, Patna and Vesali, a total distance of about 300 kilometers. According to the sutta he left Vesali at the end of the rains retreat (October) and of course he is supposed to have attained final nirvana in Kusinara on the full moon of Vesakha (May). This suggests that he took seven months to travel about 95 kilometres. Even allowing for the fact that he was old and in ill health this seems like a very long time. It should be pointed out that only later text in the Tipitaka mention that the Buddha’s parinivana took place at Vesakha and the sutta gives the impression that while his last journey was slow it was at a steady pace. However, it seems likely that the Buddha conducted his journeys at a leisurely pace. The evidence suggests that he would wake before sunrise, go for pindapata in the nearest town or village just after sunrise and having eaten, would set off while it was still cool. He would walk until the midday heat became unpleasant and then take an afternoon rest. If there was a village nearby he might stay until the next morning and if not he might continue walking until he got to the next village. How long he stayed at a particular place would have depended on many factors - whether local people came to talk with and listen with him, whether food and water was available, whether the atmosphere was congenial. We know for example that he cut short his first stay in Rajagaha when people began to complain that too many young men were leaving their families to become monks (Vin,IV:43). Once he arrived in the village of Thuna to find that there was no water to drink because the brahmin inhabitants, hearing that he was coming, had blocked up their wells with rice husks and cow dung (Ud,78). The warm and respectful reception that Buddhist monks get today was not always available to the Buddha and his disciples. He is often described as travelling with either 500 monks (a conventional number meaning ‘a lot’) or simply with ‘a large group of monks’. At other times he would dismiss his attendant and companions telling them that he wanted to wander by himself for a while (S.III:94).